Teams from Tincher Preparatory School won first and second place in the recent RoboBowl at McBride High School, where students from local middle schools learned about science, technology, engineering and math while showing off their robotics projects. A team from Hughes Middle School won third place, and a team from Hamilton Middle School took fourth. Students on the winning Tincher teams were Olivia Hibson, Lucy Boucher, Anahi Bedoy, Kayla Maguire, Emma Halal and Ashley Phaingdy. The robotics coordinator at Tincher is teacher Deborah Drab. Lindsey Academy won the Engineering Notebook Award, while Keller Middle School earned the event’s Spirit Award. 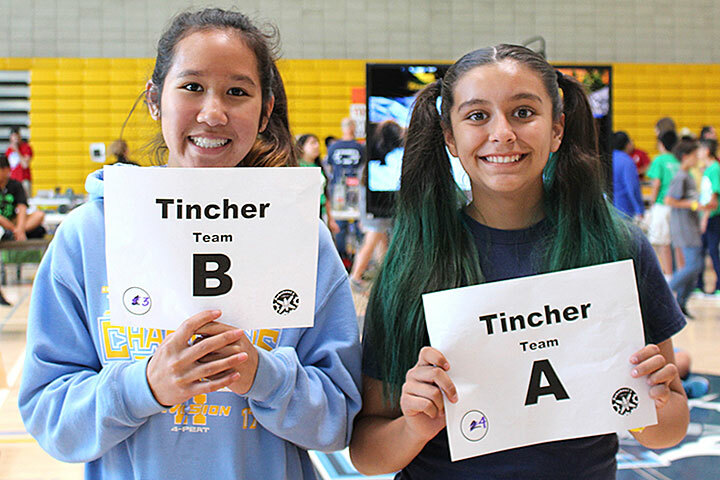 ROBOBOWL CHAMPS – Tincher Preparatory School’s Ashley Phaingdy and Anahi Bedoy were part of the winning teams in the annual districtwide RoboBowl, where students showcased their robotics projects while learning about science, math, engineering and technology.